I hope you all had a great Valentine's Day yesterday and felt well and truly loved! Whether you spent the day with your partner, family or best friends - I hope you had a good one! My boyfriend and I went out for dinner at one of our favourite places in Newcastle to celebrate and we had the best time ever! You just can't beat a cute little date night eating good food and drinking lots of Prosecco and cocktails. 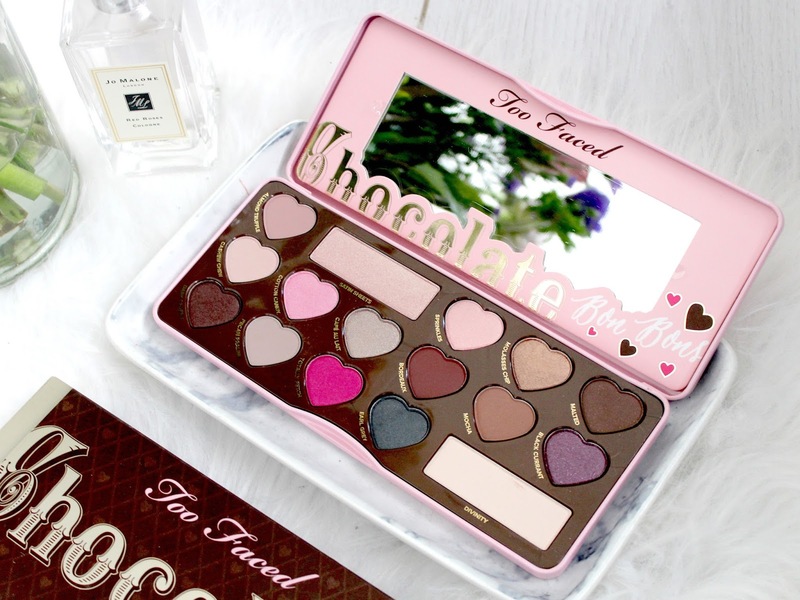 Anyway, today I want to review the new Chocolate Bon Bons palette from Too Faced which is all love themed and totally appropriate for this time of year when everyone is feeling all loved up! I'm a massive fan of Too Faced and love all of their products, especially the eye shadows, so I was really excited to give this new palette a try as most of the shades look right up my street. I say most as there are a couple I probably wouldn't use but more on that in a moment. As you can see, the packaging is adorable. It's pink, covered in love hearts and the perfect palette for a girly girl like myself. It's also made from metal and clasps shut securely meaning it's a good one to travel with as it feels pretty sturdy and well made. Not to mention it has a huge mirror making it perfect for on the go touch-ups. Inside the palette there's 16 eye shadows, 14 of them being heart shaped (again, too cute!) and the remaining two being rectangular shaped and slightly larger. The two larger shadows are two of Too Faced's cult favourites while the other 14 are all brand new shades. From left to right the shades are named Almond Truffle, Satin Sheets, Sprinkles, Molasses Chip, Malted, Cashew Chew, Cotton Candy, Café Au Lait, Bordeaux, Mocha, Black Currant, Dark Truffle, Pecan Praline, Totally Fetch, Earl Grey and Divinity. The two permanent shades are Satin Sheets and Divinity which I've personally not tried before so they're all new shades for me! As I mentioned earlier, most of the shades are very me and what I'd typically go for but there are a couple I can't see myself wearing and as I'm sure you can imagine, it's the two Pink shades. Pink isn't really a colour I associate with eyeshadow as I feel it would make me look like I have bruised eyes or some sort of infection haha! I'm sure some people can make it work though! As for the rest of the shades, they're all gorgeous. Most of them are fairly neutral with a variety of beige, brown and gold shades. However, there's also a Silver, Teal and Purple which are really wearable and are nice to have in the palette for those times I fancy doing something a little different with my makeup. I also love that there's a mixture of both shimmery and matte shades as it means I only need this one palette to create a whole array of different looks. I'd say it's one of those palettes that has something for everyone. As always, the formula of the shadows are buttery soft, pigmented and easy to blend. Did I mention they smell like chocolate too?! I'd highly recommend this palette as it really does have something for everyone and the mixture of shades and finishes means you can create so many different looks! Do you like the look of this palette? It's available to buy here for £39.00 which I think is fairly reasonable considering the amount of shadows you get. This is such a nice palette! I love the mix of colours and the neutrals look lovely :) I'm loving your new blog layout too! This palette looks gorgeous! I love Too Faced shadows, I have to check this out! Such gorgeous shades! I have the Too Faced Chocolate Bar Palette and i can't believe how creamy and pigmented the shades are. 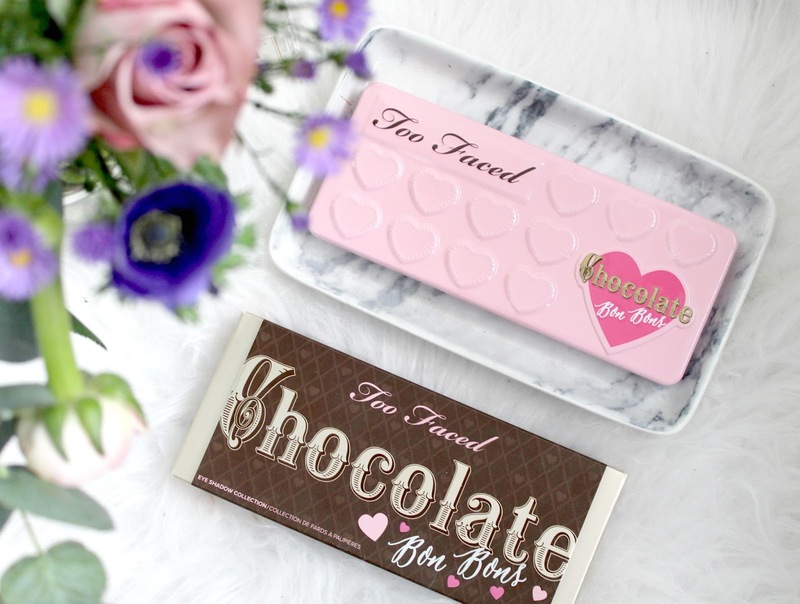 I desperately want to try some Two Faced products, they are all so cute! This is such a stunning palette and as I'm a huge fan of the original chocolate bar palette, I'm sure I'll love this one just as much! The packaging is SO pretty! There are such a huge range of looks you can get with this I totally agree. Great review! That palette is such a pretty thing! The love theme is sooo cute! 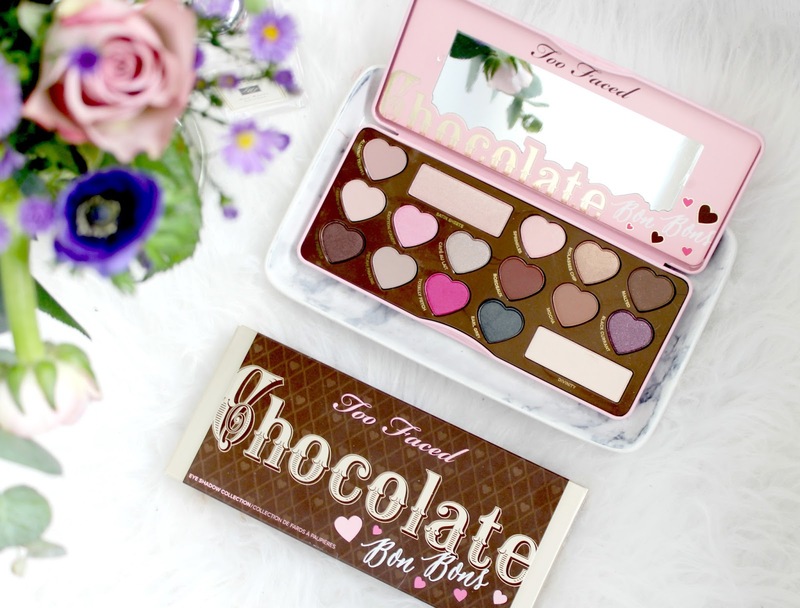 Too faced make the most adorable palettes! This looks like a really gorgeous pallet and the packaging is so cute! I really love its package and its shades!! Oh wow! Absolutely adore the packaging, the heart shaped eye shadows are adorable.you take amazing blog photos kayleigh!! This palette is too cute! I really want to try these palettes, I've heard some really great things about them! I have this palette and I absolutely love it, such good quality and it smells amazing! Have you tried the the first chocolate bar palette? If so, which one do you prefer? I'm dying to try some of the Too Faced products I've read some many rave reviews, the packaging is stunning too!